Throughout the ages, no one character of English folklore has spawned more tales of romance and chivalry than Robin of Locksley, known throughout the realm as Robin Hood. Offered here is a gambeson worthy of the outlaw that wore it. 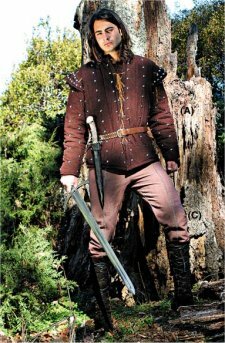 This heavy two-piece garment consists of a corduroy undershirt with padded and studded sleeves and a quilted, sleeveless gambeson. Both pieces are manufactured of a chocolate brown corduroy. The gambeson portion can also be worn with the Outlaw shirt or the shirt of your choice. Choose S/M or L/XL.